OK. I have an unhealthy obsession with the Beatles. When I was a kid I had a toy record player and I would play my dad’s records (I’m 26 and I DO know what a record player is!). One record I remember was a 45rmp of “Help!” I recall being totally fascinated with that song. I loved that I could sing it (I learned all the words). I loved how energetic it was! I loved everything about it. My dad was a music minister at our church. We had drums and other fun instruments there. Every now and then my dad would let me bring the drums home and play them. This was always a treat and it rarely happen. I remember one time, I was in 4th grade (right about the time we got our dog, Abby) my dad surprised me and brought home the drums. They were a beat up Tama Royal Star kit… bright red. My dad set them up near the stereo and put on all kinds of records for me to play along to. Among them were The Beach Boys, Elvis, ELO, Elton John and The Starland Vocal Band. The Beatles were played often those few days too. It’s worth noting that this is one of the few memories (one of 2 actually) I have of my dad sitting down to play the drums! I mean he was no drummer but I recall that he could keep the beat… he’s musical of course. It’s funny thought, I told my dad, “Dad, if I worked at a church where there were drums, I’d never get anything done… but you never play them?” I literally did not understand why he didn’t stop every hour to go play all the fun instruments. But I didn’t understand why my dad listened to talk radio either. ha! Well, thanks for letting me reminisce about my childhood for a few minutes. Oh yeah, the reason for the post. Over the last few weeks I’ve been reading books and watching DVDs on the Beatles. It’s been a fun departure from my normal day-to-day arranging and recording. 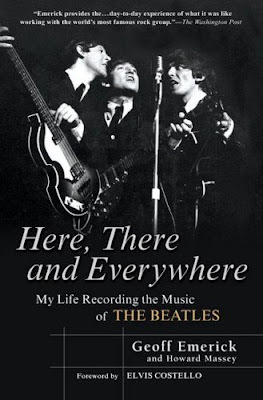 One such book I read was “Here, There and Everywhere: My Life Recording The Beatles” by Geoff Emmerick and Howard Massey. Emmerick was the engineer that recorded much of the Beatles work. It was REALLY great. Tony Guerrero got it for me as a Christmas present (it’s actually an audio book so I actually listened to it.. I didn’t “read” it). If you’re into recording you’ll like it. It’s really interested to hear the way things were done in the 60’s. If you just like the Beatles you’ll love it too just because of the cool stories. Go on. Go get it. Hey guys. I just had a chuckle to myself. I’ve recently begun working with a company called Open Labs. These guys make fantastic keyboards! Their Meko and Neko series keyboards are actually fully functioning studios based around a powerful PC computer. Anyway, Saddleback used our new custom Neko during our Christmas special for the Fox Network. I was interviewed for their website. 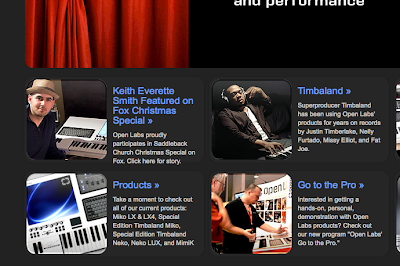 I logged on to openlabs.com and this is what I saw… my face next to Timbaland!!! Timbaland is writing hit after hit these days with artists like Justin Timberlake, One Republic, Madonna… the list goes on. I just thought I’d share. Click here to read the entire article. I can’t recommend these guys enough! Hello world!!! Well, hello blogger! I’ve been blogging semi-regularly for a few years using Myspace. I love to teach! I especially love to teach about recording or anything music. I’ve decided that this blog should be at least partially devoted to recording tips, tricks and tutorials. I’ll be posting articles, links and videos on all kinds of topics. I don’t necessarily want to teach you all of the ways to record, but I do want to teach you the way I do it. You in? This should be fun! Oh yeah, I also spend a lot of time arranging and composing. Guess what? I like to teach this too :) I hope to offer lots of resources for using Finale Music Notation Software too. Aside from all the learning you’ll be doing, you’ll read about new happenings in my studio, fun facts and complete randomness.